Telepresence. An attractive concept for the Bentley and brie set, I guess. But, intriguing all the same (how the other .05% lives, an entire publishing industry has grown up around our fascination with how the [inordinately? unworthy?] rich spend their money and time). From a trade publication titled Collaboration Loop: Collaborative Technologies in the Enterprise, comes a useful update to this topic covered in WcW004 some time ago. 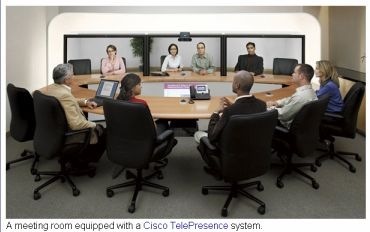 I recently got an update on Cisco’s telepresence initiative, and some of the facts are interesting. Clearly, there’s plenty of value in telepresence. At Frost & Sullivan, we expect the market to grow from $27.6 million to $610.5 million between 2006-2011, with a compound annual growth rate (GAGR) of 55.6%. Not surprisingly, then, Cisco says telepresence is one of the fastest-selling products in the company’s history—Cisco has 50 new customers since introducing its telepresence systems 11months ago, and “huge” quarter-over-quarter growth, according to David Hsieh, Cisco’s CMO for Emerging Technologies. The company won’t report the number of sites per customer, but Hsieh says that most customers deploy two to five units initially, and that at least five customers initially deployed 10 units or more. Large customers are not hesitating to buy the product, he says, but the cost of bandwidth does determine deployments (and may explain why the majority of customers are US-based). “Seed, adopt, expand” is the typical deployment model. I just must reprint (from Cisco by way of Computerworld, as printed in the original post) one of the illustrations, sadly lacking in this story, because of the all too true cliché that a picture is worth 22,473 (of MUDGE‘s) words. Who wouldn’t want to participate in such a conference? No travel time. No jet lag! Wildly costly, now, but immensely, seductively attractive, if one can make those numbers work. For the largest of companies, as the Wachovia example quoted, the numbers are not daunting. So, let me get this straight. I have two options. I can take the limo to the airport, fight through security even with my premium status, wait in the airline’s private lounge while my flight is delayed for the fourth time this month, etc. etc. etc. Or, I can walk down the hall, engage my customer or colleagues two or twelve time zones away from the comfort of the new telepresence conference room, and be home to catch my daughter’s soccer championship that evening. A paradigm changing technology, indeed! This entry was posted on Wednesday, October 24th, 2007 at 6:59 pm and is filed under Business, Technology, Travel, Web Conferencing, Web Conferencing Week. You can follow any responses to this entry through the RSS 2.0 feed. You can leave a response, or trackback from your own site. This is called “technology.” It advances first toward the rich, and then toward the well-to-do, and then toward the middle of the market, and finally everyone has access to it and thinks it’s a divine right. It happened with electricity; it happened with cars, it happened with computers, and it will happen with telepresence. Deal with it. … and the timespan for the downward price migration keeps diminishing — look how the iPhone price has already dropped by 33% in a few months. Can’t happen soon enough for me! Thank you for another interesting web page. Exactly where else can I get that kind of information written such an ideal way? I have a work that I am just now focusing on, and I have been on the look out for this kind of info.